Last month, our superstar Director, Vincent Maneno, participated in a General Assembly panel to talk about Digital Marketing in 2019: Strategies and tactics to stay ahead. 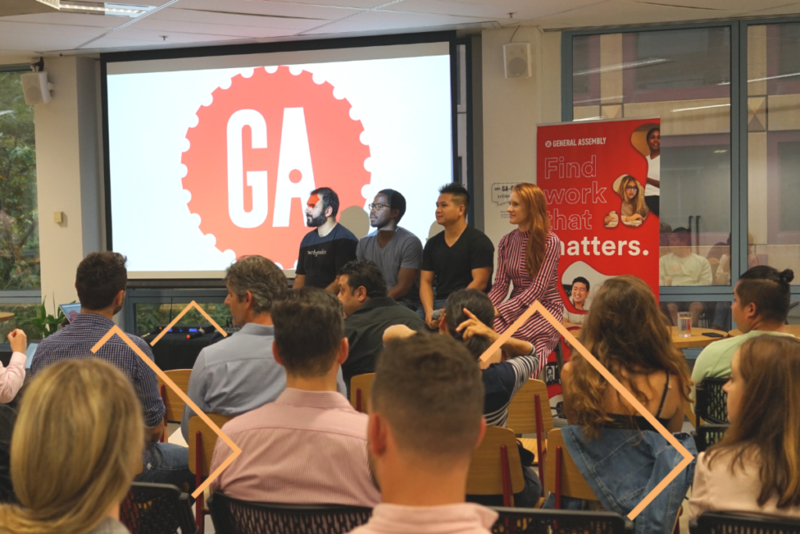 The panel also consisted of digital marketing veterans, Tam Al-Saad, Emma Sharley and Albert Mai, and was hosted by Tim Brack. So, what were the biggest changes in digital marketing in 2018? Tam noted a significant spike in the growth of Facebook groups. He observed that while this feature is not new, 2018 was the year businesses began to take advantage of Facebook groups and started to cultivate communities with similar interests to help their brands guide and understand conversations within these communities. The panel agreed that further development of AI in 2018 has affected how we use Adwords, and will continue to have big impacts on other digital advertising such as messaging and voice search. Emma noted that the Australian market has been a few steps behind America in terms of messaging spaces but is starting to see a steady number of companies taking on these new technologies. She predicts the future of voice and chat to move beyond purely transactional experiences, to something more personalised and geared to foster brand engagement and loyalty. Sharley was also excited to see brands moving towards the corporate influencer space – using micro influencers to aim at smaller, more targeted audiences. This is in line with wider industry trends in influencer markets, which have found micro and even ‘nano’ influencers are performing better than before. Where have clients been spending digital media budgets? There was consensus on the panel that budgets needs to shift towards the ever-changing landscape of Facebook, stories on Facebook and Instagram, and chatbot marketing. Resources being allocated towards building upon Natural Language Understanding skills was also emphasised. And of course, with Facebook’s increasingly stringent policies and review processes, there should be budget put towards high quality content. What is Growth Hacking and Growth Marketing, and should more companies adopt this strategy? Albert explained the process of Growth Marketing, something that will be familiar to all our startup clients. However, Albert’s approach is that all companies, even larger ones, should consider this holistic approach towards their business. Tam didn’t necessarily agree. He warned of the limitations of Growth Marketing and that brands should not forget a balanced structure within their teams after seeing companies issuing an overall goal of “growth” amongst all departments. A company as a whole should not be “growth-focused” especially at the expense of individual teams and and their diversity of skills. He advised that companies should be ultimately striving for an insightful understanding and creative interpretation of data to unify the user experience instead. Have you tried growth hacking? What’s your view of how it affected your business and your team? With Google pushing an agenda towards more automation and quickly improving their ability to create content for ads, bid management and broadening keywords, will there no longer be a need for digital marketers? Even though Google has touted their every project is AI-fuelled, Metric Labs’ superstar Vincent, stressed that there is still an important role for a human intelligence in the future of digital marketing. The current developments in Google and Facebook AI projects are geared towards increasingly accurate predictions. This kind of accuracy will help us achieve our business goals, but those goals need to be set by people. Creating a strategy, knowing what you want to achieve, and how you want to get your message across – these are all things no AI will be able to do. At least, not in the near future. In an increasingly data driven industry, and with clients becoming more data-literate every day, Vincent also emphasised that we as marketers need to be transparent and accountable when we share our data. We should be helping our clients understand the relevance of their results, and showing them how to use data to support insights that will take their brands into the future. What is the best way of advising clients and managing expectations in the complex and changing social media landscape? The rest of the panel all agreed that a successful strategy is to work backwards and really understand the customer journey: what stage did each channel play a role in? Where are people frequenting and are they recommending things to one another? At what point did conversion happen? Knowing your audience always makes you a better advertiser – no matter what channel you’re working on. What skills are our panelists looking to pick up this year, that doesn’t have to necessarily related to digital marketing? The panel ended with a more personal question, but the panellists were so passionate about digital marketing that the skills they wanted to develop were: user experience, customer research, chatbot building and natural language understanding. Like this blog post? Sign up to our email newsletter – Lab Report – and never miss a new one. Or, get it sent straight to your Messenger!